Novartis is taking India to court to stop production of affordable generic medicines that millions of people depend on to stay alive. The drug company Novartis is taking India to court to stop the production of affordable medicines by generic drug manufacturers. Millions of people in developing countries depend on these lifesaving medicines to stay alive and healthy. Ahead of the final hearing at India’s supreme court, join our campaign and call for a stop to this attack on generic medicines. Doctors Without Borders/Médecins Sans Frontières's (MSF’s) Drop the Case campaign, launched in response to this move, gathered nearly half a million signatures calling on the company to drop its case. But six years later, the legal battle continues. India’s supreme court is now due to give the final judgement on the case this year. MSF has renewed its campaign calling for the company to stop its attack on generic medicines. Why India Is the "Pharmacy of the Developing World"
India is often called the "pharmacy of the developing world" because it produces affordable generic versions of medicines that are used the world over. More than 80 percent of the antiretroviral medicines (ARVs) used by MSF in its HIV/AIDS programs come from producers of generics based in India, just as 80 percent of the ARVs purchased with donor funds globally come from India. MSF also relies on Indian generics for malaria and tuberculosis treatments. India became the key producer of affordable medicines because, until 2005, the country did not grant patents on medicines, allowing generic manufacturers to freely produce more affordable versions of medicines patented elsewhere. Fierce competition among producers drove prices down dramatically—whereas ARVs for one person per year cost US$10,000 in 2000, today they cost just less than 1 percent of that figure. India had to start granting patents for medicines in 2005 because of its obligations as a member of the World Trade Organization. This means that price-busting competition between generic and originator drug producers will be blocked for drugs that receive patents—for example for several newer medicines to treat HIV/AIDS. When designing its patent law, however, India decided that only drugs that show an improved therapeutic effect over existing ones deserve patents. This part of the law—Section 3(d)—intends to prevent companies from continually extending their 20-year drug patents by making minor changes or improvements—a process called "evergreening." Along these lines, the Indian patent examiner in 2006 rejected the patent that Swiss pharmaceutical company Novartis sought for the leukemia drug imatinib mesylate (marketed as Gleevec), because it was based on a compound that already existed. In response to its drug patent being rejected, Novartis took the Indian government to court in 2006, not only challenging the rejection of its patent, but also the part of India’s law, Section 3(d), that formed the basis of the decision. If Section 3(d) were overturned, it would mean patenting would become much more widespread in India, severely limiting the production of more affordable generics. Nearly half a million people signed the Drop the Case petition, including Archbishop Desmond Tutu, author John Le Carré, and former Swiss president Ruth Dreifuss. The campaign resulted in extensive media coverage and increased public awareness of the role of India as "pharmacy of the developing world." While the company never dropped its case, the Madras High Court in August 2007 ruled against Novartis. Undeterred, the company has continued to appeal against each legal reversal, with the result that India’s final court—the supreme court—is now due to hear the case in February 2012. 1994—India signs the World Trade Organization's (WTO's) Agreement on Trade Related Aspects of Intellectual Property Rights (TRIPS Agreement), which means that it must now start granting patents on medicines no later than 2005. 2003—Novartis launches its imatinib mesylate as a blood cancer medicine (brand name: Gleevec) in the United States at $2,600 per patient per month. Generic versions of Gleevec soon become available in India for under $200 per patient per month. 2005—India changes its patent law to comply with the TRIPS Agreement, and medicines can now be patented. But the law stipulates that only true medical innovations will be granted patents. Section 3(d) of the law specifies that new forms and new uses of known substances cannot be patented, unless they demonstrate a significant increase in efficacy. 2005—India’s patent office starts examining patent applications on medicines including Novartis’s patent application for imatinib mesylate. January 2006—Novartis’s patent application on imatinib mesylate (Gleevec) is rejected by an Indian patent office on several grounds, including on Section 3(d) that it is simply a new form of a known substance. May 2006—Novartis files two legal challenges in the Madras High Court. One is to appeal the rejection of the patent. The second is to have Section 3(d) of the Indian Patents Act declared contrary to the TRIPS Agreement and to the Indian Constitution. 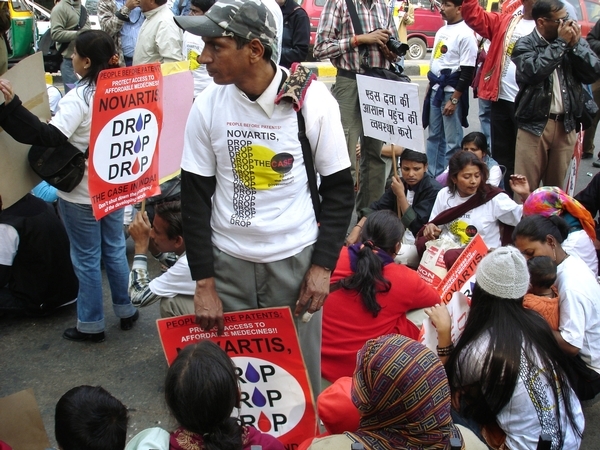 December 2006—MSF launches an international petition calling on Novartis to "Drop the case." Four hundred fifty thousand people sign on but the company does not back down. August 2007—The Madras High Court rules against Novartis in its case to overturn Section 3(d) in India’s patent law. The Madras High Court also rules that "efficacy" under Section 3(d) would require Novartis show an increase in therapeutic efficacy. MSF hands over its petition of close to half a million signatures to Novartis in Basel. June 2009—The Intellectual Property Appellate Board which is responsible for hearing appeals on patent applications rejects Novartis’s appeal and confirms that imatinib mesylate does not deserve a patent, on the grounds that the company was unable to show significant increase in efficacy as required under Section 3(d) of India’s patent law. August 2009—Novartis approaches the Supreme Court of India in a new case—this time seeking to challenge the interpretation and application of Section 3(d) by Indian courts and patent offices. Final arguments are due to start before the Supreme Court on 28th February 2012.